Having some experience in earning money over the Internet I have been looking for websites which pay up for something we already do. i find such make money online programs extremely attractive, because if you think about it, there are many Internet sponsors, who would pay you to use their services. For example, being a webmaster, I share a lot of files with my friends and blog readers. You can not even imagine how glad I was to find out that Uploading.com rewards you with bonuses (cash prizes), if you use their free file hosting service. There are many more examples of work from home methods, which can give you rewards for something you already do or would like to try doing. Earning money with paid search engines is just the right example. It is hard to imagine how much money Google or Yahoo is making per second and that is why new and less known search engine websites are willing to pay you to use their services. They use the idea of the revenue sharing websites and reward you with special points for every generated search query. Personally, I do like the whole concept of making money online by using sponsored search engines. And I have several reasons for this – being a webmaster requires a lot of research and it is a well known fact that different search engine websites provide different results, so my experience so far tells me to check multiple sources, which gives me more results, the results from which I can distinguish only the best and most suitable ones. As you can see, I would not mind using a brand new search engine site, especially if I can get money on rewards for my daily activity. If the whole point of earning cash and prizes by generating searches was scam, why would I be so passionate about it and give you such a detailed explanation of the whole process and even worry about giving you the list of free stuff and cash I managed to win. As for me, the whole idea of making money with search engines has started from a well known paid to search website called Winzy.com, which now unfortunately has been discontinued. But as a matter of fact, after registering at this website I started to earn points for using Ask.com search engine and got some profit pretty soon. The main criteria for getting points was the dialy activity and apart from that users were able to refer new interested members. All in all, I was really glad to win some Amazon gift cards using this fine revenue sharing website. So in the end I came up with several 10$ gift cards from Winzy. Right heter that the new and more popular sponsored search engine was launched and this company, as far as I remember My Search Funds, was paying its users 6 cents for every search query. They did approach the whole business seriously and had several tools for earning money – special user search bars and even branded landing pages, which had search tools on them. As the result I was making several dollars a day by searching Google, MSN and Yahoo. The whopping monthly payment of 120 dollars really made my day. Right after that, My Search Funds turned into another company with another set of owners and now you can only donate the money you earn by searching to a charity organization of your choice. No matter what, the whole process of making money with My Search Funds was interesting and profitable for me. I do not really want to tell you about every single prize I have won using all possible paid to search websites, just will remind you that last week I got my first prize from Irazoo.com website – 5 dollar Amazon voucher, which sounds pretty well assuming that I have only been using this website for a day or two. So in general, in would like to prove you that earning money and winning prizes with sponsored search engines is possible. You can see my actual post, “Earn Points And Win Free Gift Cards Using iRazoo Search Engine – My First Prize Received“, which was released just several days ago. As far as my post is entitled “Top websites which pay you to use sponsored search engines” I will supply you my vision over the websites, which will reward you to use their sponsored search engines. 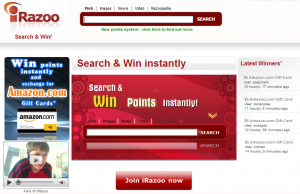 Irazoo is a 3 year old search engine project, which targets better search results by their user feedback function. 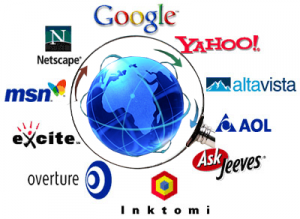 If you are looking forward to getting better search results, which are based on top search engines. When you use Irazoo search, you get the results based on four search engine websites (Google, Bing, Yahoo and Ask.com) and in addition you have special user results according to users’ votes and comments. All the comments are visible and you can see the feedback before actually visiting the link. As an Irazoo member you can generate searches, leave you comments and website rating in order to earn points and redeem them to prizes. As you can see, the whole process is pretty simple and you basically get paid for something you do on daily basis. I consider Irazoo.com to be the most interesting and promising get paid to search website nowadays and that is why it is ranked #1 in my list. There is the whole list of stuff I like about this website – chances of winning free stuff instantly (when you stumble upon the lucky page and receive you prize instantly) apart from getting points for your daily searches. Another great thing about this revenue sharing website is the referral bonus program and by using it you can earn up to 1550 points per referral (and if you compare – an Amazon gift card is worth just 3000 points in the prize redemption store). Speaking of prizes, in my full Irazoo review I have supplied the whole list of prizes you can win by using this sponsored search engine. But I can tell you that the prize list begins with smaller cash prizes, such as 5-25 dollar gift cards and ends with such awesome and expensive things as MacBook Pro or Sony PlayStation 3. Anyways, you can check out my previous post about getting free stuff with Irazoo paid search engine, but now lets move on and see what other get paid to search websites are currently available on the make money online market. The full review of Irazoo.com could be found by the supplied link, or you can generate a blog search with “Irazoo.com” query. 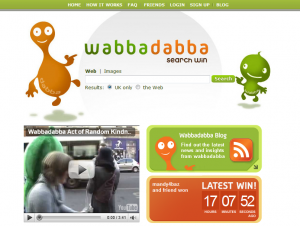 WabbaDabba.com is a UK based sponsored search engine, which provides the opportunity of receiving instant prizes, while using their free sponsored search engine. I have been using this website earlier on and so far I am satisfied with everything I see (even though I have not won any prizes yet). As far as I remember, the WabbaDabba website is powered by Ask search, so the results leave much to be desired if you are looking forward to receiving a large search result list. It works pretty much like any other paid search engine – you sign up at their website, become an active member, generate sponsored searches and get a chance of winning free stuff. Unlike other websites, WabbaDabba does not have the point system, but as for me, it is not such a big disadvantage, every search you make at WabbaDabba.com gives you a chance of earning various instant prizes, apart from all possible monthly promotions. I have placed this website in the second place of my list, because I see how many people are winning with WabbaDabba.com and really hope for my success too. The only downside is the geo-targeting, which is applied to the search engine and you get mostly results from the Uk. Other than that, this website is worth using and winning free stuff with. So if you are interested in getting a chance of receiving free prizes by using free sponsored search engine, you can check of my detailed WabbaDabba.com review. As I may have already told you – my friends and I will be using this website more often to get higher chance of winning something – just to supply you a payment proof (I would be really thankful, if you can share a WabbaDabba prize proof). So this was my second item in the “get paid to search” website rating and I have no other choice but to move on. BigDevil.com was originally one of the first websites to support the get paid to search concept and I have been registered with this site over three years now, but was not actively using it. Even though this sponsored search engine is a bit old now, it does not make it less competitive. As for me, the market age of BigDevil.com is just a big advantage and it makes selected search engine even more trusted. Here you can earn chances of winning prizes in several easy ways – generate the searches yourself and get a chance of getting free stuff. Invite your friends to join BigDevil and just wait for them to benefit you. The 100% referral program makes it really easy to win stuff by searching – if any of your friends wins something at BigDevil, you get the same prize automatically. Also there are all possible sweepstakes and monthly promotions, and all these will help you in winning free prizes at BigDevil.com. 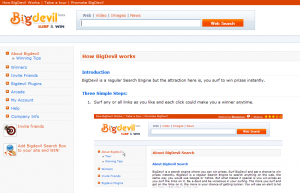 Here is some extra information about Big Devil paid search engine – “Get A Chance Of Winning Instant Prizes With Bigdevil.com“. But the only thing I would like to change about this website is the amount of prizes, nowadays they do not let you earn as much prizes as they used to. 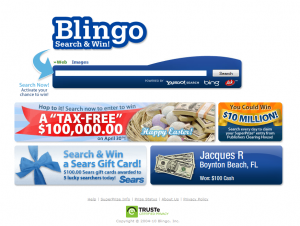 Another great website I have been using for more than three years now is called Blingo.com. This sponsored search engine is based on major search engines (Yahoo, Bing, Ask.com) and provides pretty nice search results. Even though I am starting to use this website more often now, it still looks very promising, because according to their front page statistics – there is a prize winner every hour or so (which sounds not that bad, if we compare it to other sites I have been talking about in this post). The prize range is really wide, at Blingo you can win free Amazon Gift Cards, Fandango movie tickets or instant cash prizes by using this sponsored search engine. As for the promotions, they have quite a lot of them, as for example, today they have a promotion deal, according to which, there will be at least one winner every 10 minutes (sounds like fun? – I think so). I am looking forward to hearing more about this website from my friends, who are running a little investigation over this website, and will notify you with the search results. All in all, Blingo seems to be like a great website and for sure just another get paid to search opportunity Internet offers us. 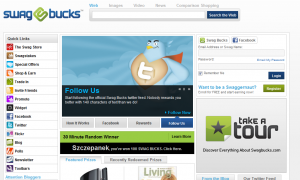 Another great website, which offers you a chance of winning prizes by searching Google, Yahoo, Ask or Bing.com. All the search results are generated into one page results, and you have the ability not only earn points for searching, but get high quality search results, which are based on main search engine websites. 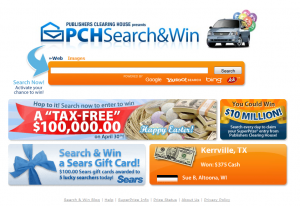 PCH is a huge website/company, which is connected with various surveys and sweepstakes, but in the end, they offer a great service – PCH Search. By using this search engines you can receive special points for doing so. Every point is an entry in monthly lottery contest and a change of getting one of the numerous instant prizes. You may want to check out the full PCH Search review to get the whole earning idea of this site. As we are approaching the end of my “get paid to search” website rating, I would like to give you some information about another great site, which offers free stuff for their active website users. SwagBucks.com is constantly offering new features and new prizes. At SwagBucks you can get paid for something you already do and earn point for things you tend to do on daily basis – search the Internet, buy stuff at your favorite Internet stores, fill in various surveys, take quizzes and much more. For any of these activities you will be earning points. All points could to redeemed to awesome prizes at SwagBucks prize store. The website is totally free to join, if you reside in one of the supported countries – USA, Canada or UK. Only this factor – country restriction – has put this sponsored search engines so low, other than that, it is one of the most promising sites, which pay your for daily search activity. 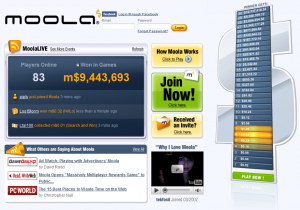 You all know that Moola.com is a popular get paid to play websites. It pays you to play all possible trivia games with real people, but also you can earn money for using their sponsored search engines. For every search you can get chances of winning money. The website is programmed to give you money for searching everyday. When I used to play games for Moola, I was making from 5 cents to 1.5 dollars for searching in prizes. This is a pretty nice record, taking to consideration the fact that you could easily double the amount of money by playing free games at Moola.com. As you can see, earning money for searching is a pretty fresh and interesting business model, so many work from home websites are actually offering such services. As far as I remember, Moola.com is an invite only website, so if you want to get a free Moola.com invitation, you can refer to this post and leave me a comment down there. Apart from making money online by searching, you can put your Internet activity to good. There are several charity organizations, which are based on the “get paid to search” website concept, but they donate all the money generated by users to the charity organization of your choice. Usually we don’t think about other people, who could be hurting more then we do, so even several searches could generate some money to people, who really need it. As for me, it is a really good thing to get involved in. Everyclick.com is just the website I am talking about, and so far, this project has raised £1,086,189.27 for charity (sounds impressing, huh?). For more information about Everyclick.com, please visit the link provided. Also there are some more websites, which consider sponsored search engines to be a great way of generating good money for charity. 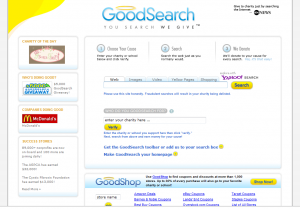 GoodSearch.com allows you to use the Yahoo! search like you normally would and donate the money you generate to the charity organization or school of your choice. The whole process is really simple and you don’t need to fill in any registration forms. Everything is pretty straight forward, and you can read more about GoodSearch sponsored search engine in this post. Thanks for reading this huge post and I really hope that I have supplied the most detailed information about earning money with paid search engines. If you know any other websites, which supply such an opportunity, a chance of earning cash by searching, please leave me a comment with the link to the website and your personal experience. I will try to make up some more posts like this, which will explain my personal experience with some work from home method and with the links to the most popular websites. I think I have done something like this in my article “Making Money Online With Get Paid To Upload Websites Explained“. In this post I have just told about top three sites, which give you money for uploading files on the Internet, but the whole version will be a bit longer and will have more personal experience, as far as I have received my 4th Uploading.com payment and 3rd payment by Letitbit.net. Thanks for reading and don’t forget to subscribe to receive full posts to your email. The sign up form is located below the top navigation of the blog. Note* I advise using swagbucks and irazoo before blingo because of the navigation of the sight, and the large prize varieties given. I will be grateful to be introduced to this awesome money making opportunities on the internet.